Pew found that global climate change has risen from being a concern for 53% of respondents in 2013 to 63% in 2017 and now 67% in the most recent survey. 1. Perception of U.S. power as a threat is closely tied to views on Trump. 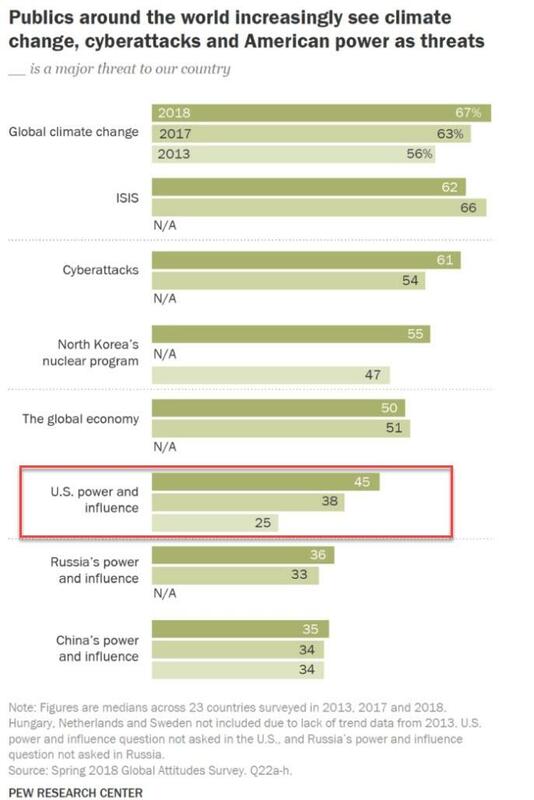 Overall, only 25% of respondents were worried about U.S. power and influence in 2013, when Barack Obama was president. That rose to 38% in 2017 and now sits at 45%. 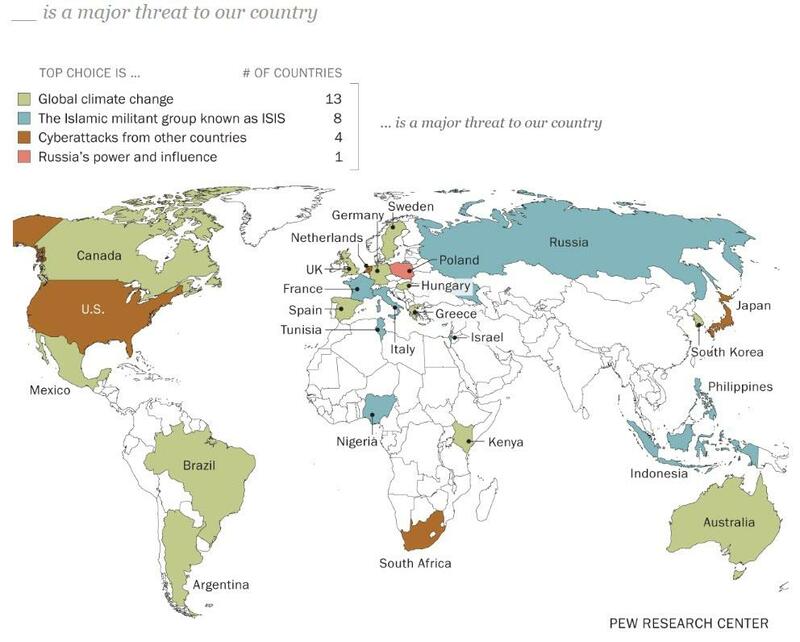 In specific countries, the perception of the U.S. as a threat rose by increases of 30 percentage points in Germany, 29 points in France and 26 points in Brazil and Mexico. In 17 countries surveyed, people who had little or no confidence in Donald Trump were more likely to name U.S. power and influence as a top threat. This difference is most acute among America’s allies, including Canada, the U.K. and Australia, where views of the U.S. and its president have plummeted in recent years. 2. Russia is the least bothered about any threats. 3. 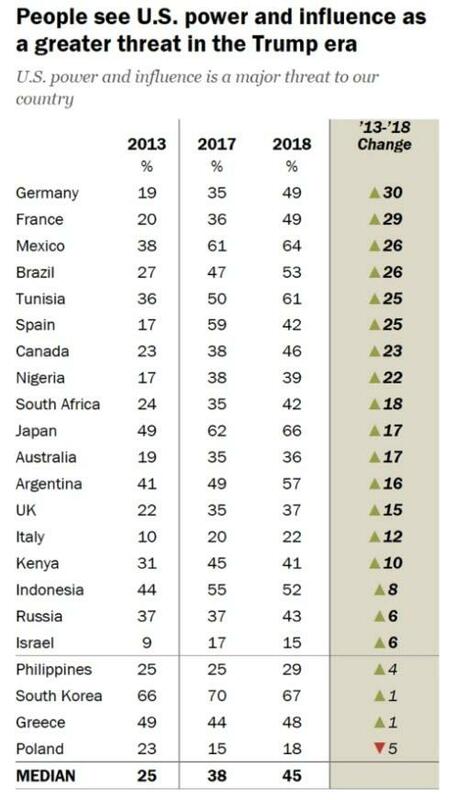 Latin America is more concerned about U.S. influence. In the three Latin American countries surveyed — Mexico, Argentina and Brazil — global climate change remains the top concern. But worries about U.S. power and influence on average were higher there — above 50% in each — than in other regions. U.S. power was the No. 2 concern for Mexico. 4. 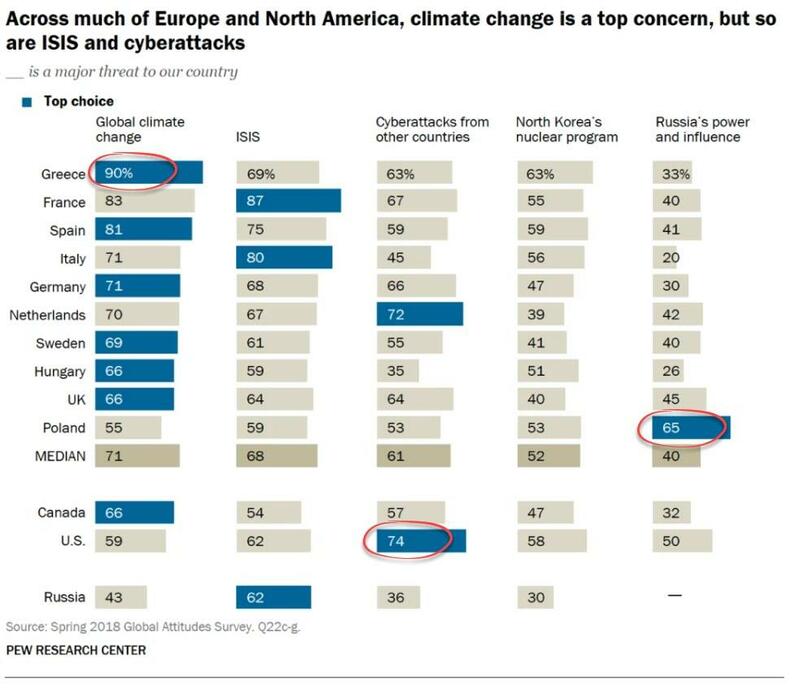 The U.S. is most concerned about cyberattacks. Nearly three-quarters of Americans surveyed said their biggest concern is about cyberattacks from other countries. The only countries with even higher responses were South Korea and Japan, each with 81%; those two countries were also among the most concerned about Chinese power. 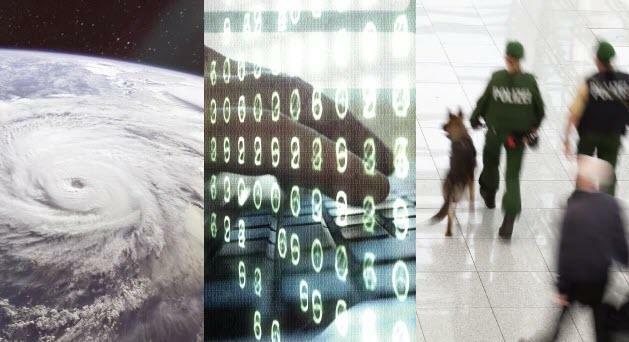 Cyberattacks also topped the rankings of concerns for the Netherlands and South Africa. Overall, 61% of global respondents are concerned about cyberattacks, up 7 points from 2017.